At HALL, we are passionate about environmental responsibility and sustainable stewardship of our land. 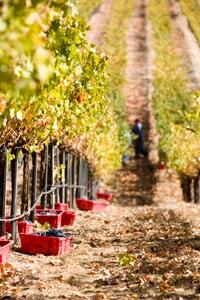 All of our vineyards have been certified organic by the California Certified Organic Farmers (CCOF). Farming organically involves committing to two principals: ecological production and maintaining organic integrity. Production methods must conserve soil, pollute little, and promote a healthy ecosystem. Soil is the most important element in creating a sustainable environment in the vineyard. Over the past fifty years, traditional farming practices have stripped essential minerals from the soil; however, these minerals are crucial in the development of healthy crops. Farmers have increasingly relied on artificial additives to replace what has been lost and to augment what nature should be allowed to do on its own. When pesticides, fumigants, and herbicides are used to protect grapes from disease and fortify the soil, the residue travels along with the grape on the winemaking process and ultimately ends up in the wine. Instead of using herbicides, organic farmers cultivate the soil using natural fertilizers (compost and manure) and plant cover crops. Plants other than vines are encouraged to grow in and around the vineyard, attracting beneficial insects like ladybugs, some mites, and green lacewings. Natural predator pests are an organic alternative instead of using poisonous chemicals. Cover crops also minimize erosion and sedimentation of local waterways. It takes time, patience, and devotion to be certified organic. This process generally takes three years because any prohibited substances such as synthetic fertilizers and pesticides must not have been used on the land for three full years before the harvest of the first organic crop. Over the course of the certification period, a farmer must identify an accredited certifier, answer lengthy application questionnaires about his or her weed and pest management practices, work with the certifier to review the application, and submit to an on-farm inspection. HALL Winery was recently featured in the March 31, 2010 Wine Spectator article “Green from the Ground Up." In the article, Mike Reynolds, HALL Wines president said, "We believe the conversation is going to change.' 'Today people ask, ‘Are you organic, are you LEED-certified?' We believe the question in the not-too-distant future will be ‘Why are you not?" Organic agriculture is a way for us to support the health of soils, ecosystems, and people. We’re combining innovation and science in such a way that we can all benefit from sustainable growing practices and a healthy environment.